Wax stains on the carpet. Candles can easily become a fire hazard. Even if you use them safely, you can have other drawbacks, such as wax stains on floors and carpet. Depending on their composition, wax stains can be easily removed or can cause serious damage to your floors and carpets. If you’ll follow the instructions carefully, you will be able to remove the stains without leaving any traces. When hot wax will touch the carpet, will cause significant drawbacks. Colored candles can contain dyes that will lead to stains very difficult to remove. Hair dryer. Put a paper towel over the wax stain and use a hair dryer to warm the affected area. Iron. Tear a brown paper bag and place some paper on the wax stain on the carpet. Start then iron and put it on lowest temperature. Place the iron over the paper. Remember, your carpet fibers can get burned easily on high temperatures. Baking soda can help eliminate wax stains from the carpet. Sprinkle it over the affected area and leave it on for several hours, then vacuum the carpet. Wax stains on laminate flooring. One important thing: When you spill wax on the floor, don’t rush removing it. You’ll just spread it even more! A blunt and rounded-blade knife and is a simple solution to remove the dried wax on the floor. After you remove it, wipe the floor with a dry cloth. Method 2: Put a few drops of liquid soap and a little white vinegar in a bowl. Fill the bowl with hot water and then wash the floor using the mop. 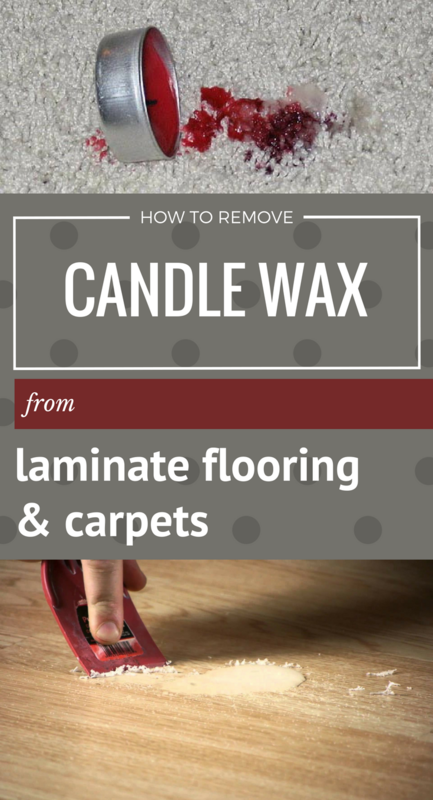 This simple and inexpensive solution will definitely remove wax stains from laminate flooring.